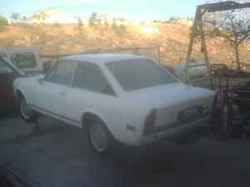 Someone pointed out this 1974 124 Coupe on Craigslist in California. Can't tell much about it, but if it's truly a California car and you are looking for a C-series Coupe, it'd be hard to go too wrong with this one. The ad says it comes with a 2 liter engine from a Spider 2000, so if you're into that sort of thing, there ya go. Someone rescue this thing and send me an update when it's back on the road! 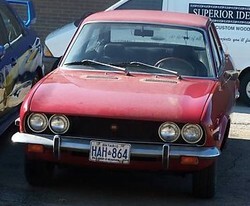 I just stumbled onto this amazing time capsule B-series Coupe for sale via a well-known FIAT enthusiast/restorer in Canada. I'll be very curious to see what it goes for....if it goes on Ebay, I guess I should say. The pictures are less than impressive, but I don't doubt the car is excellent! This looks a lot like my old '71 Coupe....and, a lot of Coupes for that matter. The ad doesn't have much information other than it implies the thermostat is bad or nonexistent and the photo looks like the whole car was resprayed.....grille, door handles and all....but a running and even halfway solid B Coupe isn't too common, so maybe someone will make a good home for this one! so, i guess that translates to.....well, who knows? It has those nice looking European market wheels and marker lights. Not sure what shipping to the US would be, but outside of a lousy economy, this could be a nice find. For now, I'll keep an eye on it and if you are reading this and you've bought the car, drop me a line! I was trying out a new Craigslist search tool yesterday & found this car tucked away in a part of the world where the only solid 124 Coupes you find are either garage queens or recent imports. This looks like a great driver built in the classic tradition of picking & choosing one's favorite (or in some cases, what's available) parts from each year to build a nice Coupe....and, to be fair, one that only serious Coupe geeks like me would ever know didn't have all the original parts. Here's a link to this nice car for sale in New Hampshire ...kinda confusing ad copy...not sure if it's a dealer or a private party or what. The car looks familiar to me, but not sure where I saw it. 124 Sport Coupe, Amazing Condition and IT's A COUPE!! California car shipped to Connecticut several years ago, purchased and driven by me, (I love it)! Minor repairs done in my term with her include replacing metal small weak spot in passenger side floor and reinforcing rear shock mounts, single weber installed and tuned on an 1800cc BC Fiat motor (California owner had transplant done from original 1600cc motor), suspension is great, five speed manual (close ratio short throw) is excellent and so is the clutch. Having properly tuned the carburator, new plugs and coil, have encountered a rough running problem which we attribute to less than perfect valve spacing... I have not had the time to address that issue. 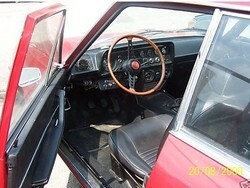 With the exception of the clock, all guages work, manual windows and all glass is in good shape and the seals are good. 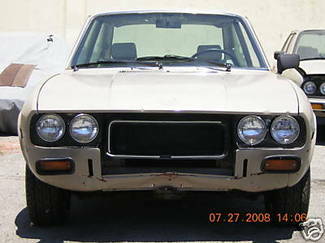 THE BODY IS AMAZING, solid with no rust issues, an incredible example when you consider 99.9% of Fiat 124 Coupes (in the world) have gone the ashes to ashes, rust to dust route (in their first ten years or less) and don't even exist in any condition anywhere! The interior is an integrated mix-match of what appears to be '72 era and '74 era pieces... Having owned (new back in the day) a '71 Coupe followed by a new '74 coupe I can't even tell what is from which group, I think the dash and seats (in excellent shape) are from a '74-'76, possibly the engine donor car in CA... none of it matters, it all fits and looks right as well as having had a new headliner installed in CA. I describe this car to my freinds as the "screamin yellow zonkerz" from the (not so) fast and (very) furious. It is an absolute blast to drive on backroads and is incredibly well balanced so even when you're not going that fast, you're having a grand time feeling like speedracer in a sports car. FREE CLIMATE CONTROLLED STORAGE for this coming winter season if the buyer is so inclined! Hard to go wrong with a $650 A-series 124 Coupe, right? Well, maybe, but here's the pig in the poke Craigslist treasure. 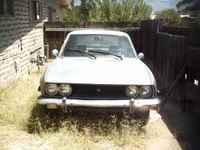 This is a 1968 (thus, A-series, with the single headlights and 1438cc original twin cam) advertised for $650 or best offer in Craigslist Los Angeles. "This is a rare car, great project car or parts car. Phone calls only no emails, $650 or best offer. " So, if you follow the link & find nothing, assume it's been sold. I got the heads up from the world of FIAT enthusiasts, so it's likely to end up in good hands. It's a market flood! No, not really. I just read the description of this one and it looks like yet another very worthy car. It's worthy, perhaps in a different way being not a beauty queen but rather a generally functional, sorted, road-worthy example coming from a state of the US known for not harboring rust. I won't try to re-post the listing on this one, but I did grab a bunch of photos. I like this car and I like this listing because the seller obviously knows what is important in terms of the making of a solid car and has provided photos detailing those aspects of the car. Cars like this don't usually impress your friends (or, your wife!) when you bring them home, but sometimes you find in the end that you are very glad to know exactly what lurks beneath the surface aesthetics. At the time of writing, the bidding on this one is at $3,150 with 18 bids...and ending today! It must be the season! 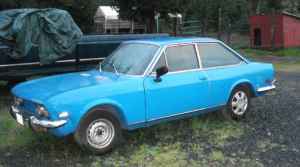 There is another 1973 (C) 124 Coupe on Ebay now. Looks like I missed this one the first time around. Anyway, this one was just repainted, bumpers re-chromed, etc. Looks a like a few more miles (as if that matters!) than the previous, at a hair over 100K. It's got 15 bids and is sitting at $4,550 at the time I'm writing this. "RE LISTING DUE TO DEAD BEAT BIDDER. 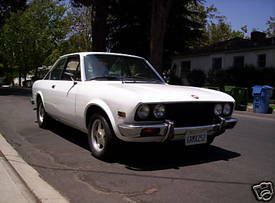 UP FOR AUCTION IS MY 1973 FIAT 124 SPORT COUPE. I AM THE SECOND OWNER OF THE CAR. IT WAS OWNED BY A FRIEND WHO BOUGHT IT NEW. HE ACTUALLY HAD A FIAT SHOP IN STUDIO CITY CA DURING THE 70S AND PART OF THE 80S. I HAVE HIS PERSONAL PLATE IN THE TRUNK OF THE CAR "FIATKING" HE OFTEN OFFERED ME THE CAR BUT THOUGHT IS WAS WORTH TOO MUCH. I WAS OFFERED THE CAR AFTER HIS PASSING AWAY. I BOUGHT IT FROM HIS BROTHER. THE CAR WAS STORED IN DOORS. IT HAS ALWAYS BEEN IN SO CAL. WHEN I BOUGHT THE CAR IT HAD 99100 MILES ON IT. I KNOW THIS IS THE ORIG MILLAGE. THE ODO HAS JUST TURNED OVER. IT NOW HAS 99 MILES ON IT. TIMING BELT HAS BEEN REPLACED ABOUT 400 MILES AGO. CAR HAS NEW TIRES. BODY AND PAINT WERE JUST COMPLETED IN MY SHOP. CAR IS A REAL HEAD TURNER. PEOPLE HAVE NO IDEA WHAT IT IS. CAR RUNS GREAT. I OFTEN DRIVE IT ALL DAY LONG, JUST TOOK IT OUT TODAY. 95 DEGREES, 80 MPH CAR RAN LIKE A TOP. TEMP STAYS AT 190 DEGREES. FANS WORK. EVEN THE CLOCK WORKS. THE FIAT HAS A BECKER NEW YORKER AM FM CASSETTE. THE UPHOLSTERY IS IN GREAT SHAPE. JUST HAS A FEW PANELS ON THE SEATS REPLACED. NEW HEAD LINER AND CARPET. THE CAR HAD NO RUST VERY SOLID THIS IS A CLEAR TITLE CAR NOT A SALVAGE. EMAIL ME WITH ANY QUESTIONS THE BUMPERS FRONT AND REAR WERE ALSO RE CHROMED"
I missed posting this one.....a very nice looking 1973 124 Sport Coupe that was briefly listed on Ebay. 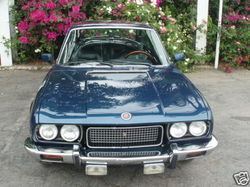 This was a clean California car being sold by a long-time FIAT enthusiast. Bidding was ended early at a point where the bid eas $3,750. This one was a good example of how nice a C coupe can look with the smaller style C bumpers. 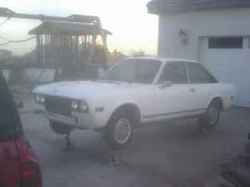 "Up for auction I have this rare 1973 Fiat 124 Sport Coupe, one of a kind. 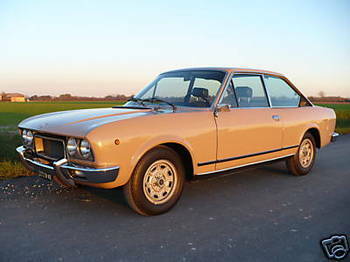 This coupe has been restored by a Fiat enthusiast of over 30 Years, and it shows. The car is a southern California car so it is rust free, and the engine and transmission are original and run strong. The car has some imperfections such as the differential is leaking a little, the exhaust hangers need to be replaced and some imperfections in the paint, nothing major. The vehicle comes with a salvage title, for reasons unknown. We have inspected the vehicle throughly and have not found any evidence that the car has been involved in a wreck. The only body work that has been done is the roof had a dent in it and the trunk had some minor rust, all of this has been professionally repaired. The 1592cc engine and 5 speed transmission run great with no weird noises and smooth shifting, never been modified. Front suspension and alignment are fine with no major problems, or rattles, the chassis is straight and rust free. The interior is tear free with new roof liner and a re-upholstered dashboard, all the gauges fuction fine except the radio. The rims are a rare 4 x 98 Eagle Sport rims, if you own a Fiat, you know how hard it is to acquire rims with this bolt pattern. This was the last year of the beautiful chrome bumpers before the DOT made Fiat change them to an ugly 5 mph heavy bumper which made the car hideous. Please be aware that we are not in the mood for games, we have been dealing Fiats in eBay for years, and we are also affiliated with the Southern California Fiat club, so we are not here to rip anybody off. You are free to ask questions only if you are serious about purchasing the car, we don't want any hagglers, tire kickers, dreamers, perfectionist or fools with their own contracts. Furthermore No trades, there is no reserve so the highest bidder will take it home. If you would like to make an appointment to see the car, that will not be a problem, car is located in Studio City California." It sounds like someone, somewhere has added a very clean Sport Coupe to their collection. Let's see this car out on the road!